Our goal is beauty through health and relaxation. Individualization of treatments is vital in reaching this goal. Our wide variety of treatments enables us to provide you with a multitude of choices to best suit your needs. Visit our world-class spa. Relax and enjoy. Mentioned in the May 2008 issue of TV personality Rachael Ray’s magazine as one of the “10 best value spas in the country”. Enjoy a refreshing drink by a cozy fire while you wait for your next spa service. 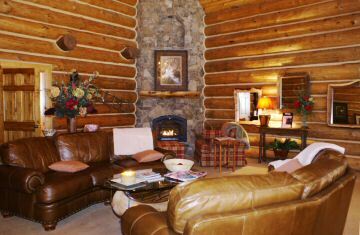 Our relaxation area is warm and cozy. It’s a great place to wait between all your services. We are proud to be the preferred salon for so many from Ellijay, Blue Ridge, Blairsville, Hiawassee, and Jasper Georgia.